Want to be a super star in meetings? Want to impress your boss by providing great summaries of meetings? Learning to use mind maps in meetings will help you achieve that goal. We already added some meeting mind map templates to make things easier and now we’ll discuss how to effectively use mind maps in meetings. When it comes to mind maps in meetings many associate it with taking notes. But mind maps can be use for many other things like planning the agenda and preparing the meeting minutes. With Creatly’s real time collaboration capabilities, every participant in the meeting can modify the mind map and instantly see the changes made by each other. Take seconds compared to hand written notes – Mind maps show keywords or important points. So you can quickly add the keyword in your mind map and participate in the meeting so you wont miss anything. With traditional hand written notes you spend time writing sentences which hinders you participation of the meeting. Easy to Visualize Connections – A mind map is a visual tool that shows connections. Arrows show the connection between each flow and the direction of the flow. This makes if easy to figure out what needs to be done first, which task is blocking what etc. Improves Your Memory – As mentioned in the above point, mind maps only have keywords. So when your summarizing or going through the mind map after the meeting you need to recall the context and the underlying details of the point, all of which helps to improve your memory. Helps Others to Visualize – If you use a tool like Creately Mind Map Software, you can share the mind map with all the participants and see each others changes in real-time. So a note you added to the mind map is instantly visible to the others, helping everyone get a clear picture of the meeting. You can never do this with traditional hand written notes. As mentioned before most people use mind maps in a meeting to take notes. 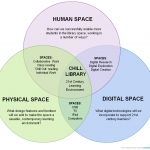 This is mostly because of traditional mind map software and mind map templates. 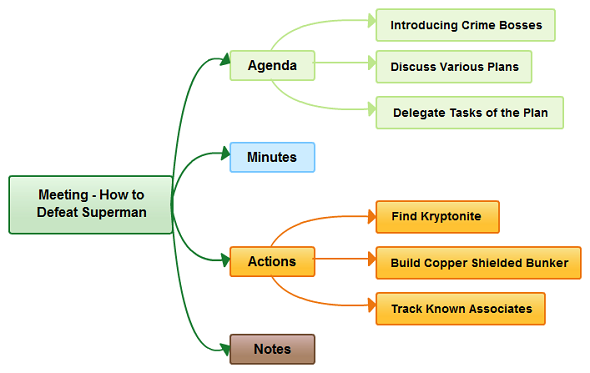 But with real-time enable software you can use mind maps to plan the agenda as well. The great thing is you can share as you build the mind map. You can only share the mind map with managers while planning the agenda and share it with the other participants when the actual meeting starts. For example the mind map above can be shared with a crime boss and he can expand it like show below. With Creately it just take three clicks and typing in the text. When you have the final mind map of the meeting summarizing the the meeting becomes very easy. You have a clear breakdown of the agenda, notes from the meeting and more importantly how each notes connect with each other, decided actions to be taken after the meetings and many other things you need to summarize the event. Because the mind map shows the keywords or the main points only the recalling part is very important here. As explained in the above sections, mind maps are a very effective tool to in a meeting and with some practice you can use it to increase your productivity and impress your peers. If you are not using mind maps yet, you can get started here >>>. I don’t currently use mind maps, but I’ve been looking for a few new tools to better organize my time and thoughts, and mind maps might be just the thing I’m looking for. I’ll have to experiment with this! @Tech Crates , Mind maps are definitely a great way to keep track of and summarize meetings. Also we do offer a lot more than mind mapping tools 🙂 .